Pagak/Mathiang, May 3, 2017 (SSNA) — South Sudanese rival forces have renewed fighting in and around Guelguk and Mangok in Upper Nile, two senior rebel military officers who asked for anonymity because they are not authorized to speak to the media told the South Sudan News Agency in the rebel headquarters, Pagak. “The genocidal regime sent its forces to liberate the unliberated land, he asserted. A current government official with full knowledge of the fighting explained to the South Sudan News Agency in Juba that South Sudanese government sent troops to the newly-created Maiwut State a few days ago and that the real intention of the deployment is to liberate Guelguk from rebels because of the vast oil reserve there. “The economic situation is not good now in the country. The government is looking for ways to control Guelguk and other areas around it so that we start oil operation there,” the official revealed. Major General Khor Chuol Giet, the 5th Division Commander, calls on civilians to be calm and warn that the SPLA-IO will spare no life of anyone who accepts Juba’s order to come to fight the SPLA-IO. He urges government troops to think twice before landing a foot in areas under his control. “I want them [government soldiers] to think twice before coming to our areas. Don’t come or you will see with your own eyes,” he warned. Maj. Gen. Giet blasted government forces, saying “they came here to kill their own mothers, fathers, brothers, and sisters so they can keep collecting their ration from Kiir. 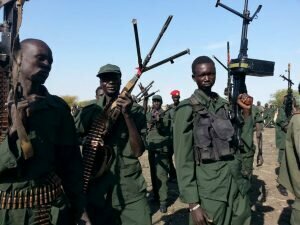 For the last few days, the South Sudan News Agency witnessed heavy movements of the armed opposition troops along Upper Nile main corridors, prompting some civilians to flee their homes. One rebel military intelligence officer claims the SPLA-IO was fully aware of the coming of government troops to Guelguk and Mangok areas. There was no immediate comment from the office of SPLA-IO Spokesman. Well done freedom fighters.We are fully behind you directly or indirectly. With who behind them may be you only behind them. By away don’t confused them that, by saying we are fully behind you directly or indirectly may not know what you are talking about . that is great, teach them any forgotten lesson those useless animals ,Nueryioni sycophant, parasites of drunker saltan of Barh el gazhal, I really appreciate freedoms fighter for not giving slaves of kiir a ground in Gatjaak land. gajaak are more strong than others. That is what I always want to hear SPLA I O should not trust in IGAD every time that Juba regime attacks you just do what you can keeping the rules of engagement. This time don’t even waste time telling IGAD, UN and the international community since they are ever quite on atrocities committed on our citizens by the government. SPLA I O you should know that the marginalized communities in South Sudan are having the hope in you so please help to keep our hopes alive. Viva SPLA I O Viva Reik machar the only leader with vast majority vision. I wish to see you people of South Sudan under one Umbrella in order to defeat upcoming general insecurity for all of us. thank you God bless South Sudan from evil ideologies. That’s a very fantastic job, gaatjak kiir deserve congratulations. Comment *It’s like what was told to crow by a folk that “go n kill your mom, I have killed my mother”. How can a people think to attack land where their mothers,fathers, sisters n brothers, and even their own offsprings live.Is there any important things else than your own offspring or family, shame on you Nuer wew. But guys you know our people(Gaajak) very well, they will finish u all if insist ur bad plan. Thank u Gaatkiir for what u have done to them, big lesson. That’s a lies, there ways for you to spla.nowadays, you will ran until you will surrender your self to the government period. God is watching all the evil doing in south sudan. This time it’s not time for looters. Buying Nuer to kill their own people is Kiir number one business. The only this IO need to put in mind is that No Mercy at all. Let IO deal with them Promptly so they should not attempted to return. jäŋ bia lay ɛlɔɔŋ ɛn walɛ mi wä nɛy duŋ dun kɛc. Salva kirr government not only nuer will be suffering or non – dinka, even the dinka also will face same suffering. we need to unite our self to defeat the devil regime of juba. PRAY FOR PEACE IN THE MEDDLE EAST! I meant they should bring peace. Riek Machar is not good and the so-called Rebels are still joking. Viva SPLM/A_IO for your great victory and let that victory be certain until Salva Kiir’s tyranny and tribalistic regime become a rotten regime. South Sudan will not progress if there is no peace and unity among the people, they need to work together and allow peace and unity to normalise . several homes have been deserted or had been razed and property had been destroyed and people had been left homeless or chased away from their homes as a result of fighting. Congratulations freedom fighters for great weldone,continueing to fighting,peace ‘ll soon come. Most people on here don’t even know what they are talking about. Ruote je kuoth te keel ke yiee! !